The now 25-year-old described seeing reports of the boat's discovery as "very emotional." In this Jan. 23, 2010, file photo, Abby Sunderland, 16, looks out from her sailboat, Wild Eyes, as she leaves for her world record attempting journey at the Del Rey Yacht Club in Marina del Rey, Calif.
Californian solo sailor Abby Sunderland said on Thursday her "heart skipped a beat" with news that the yacht she abandoned in the remote Indian Ocean in 2010 during an ill-fated round-the-world attempt had been found off the Australian coast. 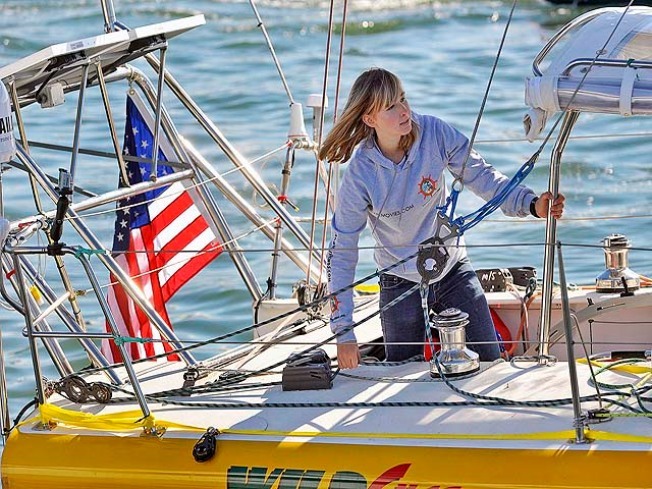 Sunderland was 16 and attempting to become the youngest person to sail around the world alone and unassisted when her yacht capsized and lost its mast in mountainous seas between Africa and Australia on June 10, 2010. She was rescued two days later by a French trawler 3,200 kilometers (2,000 miles) west of Australia. "It brought back memories — good and not so good — but it was neat to see it after so long," Sunderland said in a statement. "It looked a little creepy, that's to be expected after so long," she added. Asked if the boat, a potential navigational hazard, would be retrieved, a police spokesman, who spoke on the department's customary condition of anonymity, said the boat had disappeared by Thursday and might have sunk.